Had a great Labor Day weekend . 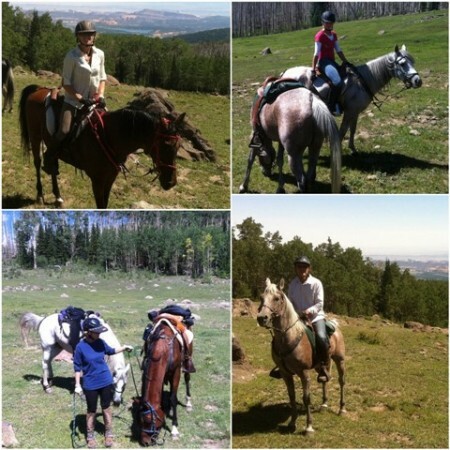 . . went hiking, riding, and camping on Boulder Mountain, a place we haven’t been to since the girls were little. It was gorgeous. . .
We went with a group of friends, and everyone but me went on horse rides both Friday and Saturday. Since I don’t ride, I went on a long hike both days . . . longer on Saturday than I originally intended because I got lost. I was never too worried, because I often heard cars driving on the two-lane highway below. I knew that I was never in serious trouble, but I did feel some pressure to get back to our campsite before the riders returned. I knew they would set out looking for me if I wasn’t there when they got back, and I certainly didn’t want that. Aside from getting lost, the hikes were beautiful and relaxing, and from Sterling’s report, the rides were great as well. The highlight of the entire camping trip for me was Friday night, when we all gathered around the campfire. Typically we’d chit chat, but this trip someone brought a guitar, and we ended up listening to a a couple with gifted voices sing, and then joining in on a few campfire songs ourselves. What a wonderful way to spend an evening. . . .
We came back home on Saturday . . . stopped at a burger joint that we'd heard about called Slacker's. Biggest burgers I've ever seen! We spent a wonderful day yesterday going to Church and having some of our family over for dinner. And today we ran several errands, discovered a tasty new Mexican restaurant, and went to an afternoon matinee of “The Help.” (Loved it!) It’s been a great way to spend the last official weekend of the summer. . . .